A large percentage of organic fuel consumed in a microbial fuel cell (MFC) is lost as a result of oxygen transfer through the cathode. In order to understand how this oxygen transfer affects the microbial community structure, reactors were operated in duplicate using three configurations: closed circuit (CC; with current generation), open circuit (OC; no current generation), and sealed off cathodes (SO; no current, with a solid plate placed across the cathode). Most (98 %) of the chemical oxygen demand (COD) was removed during power production in the CC reactor (maximum of 640 ± 10 mW/m2), with a low percent of substrate converted to current (coulombic efficiency of 26.5 ± 2.1 %). Sealing the cathode reduced COD removal to 7 %, but with an open cathode, there was nearly as much COD removal by the OC reactor (94.5 %) as the CC reactor. Oxygen transfer into the reactor substantially affected the composition of the microbial communities. 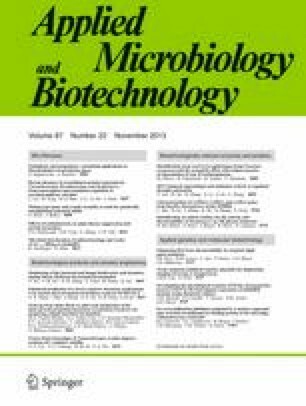 Based on analysis of the biofilms using 16S rRNA gene pyrosequencing, microbes most similar to Geobacter were predominant on the anodes in the CC MFC (72 % of sequences), but the most abundant bacteria were Azoarcus (42 to 47 %) in the OC reactor, and Dechloromonas (17 %) in the SO reactor. Hydrogenotrophic methanogens were most predominant, with sequences most similar to Methanobacterium in the CC and SO reactor, and Methanocorpusculum in the OC reactors. These results show that oxygen leakage through the cathode substantially alters the bacterial anode communities, and that hydrogenotrophic methanogens predominate despite high concentrations of acetate. The predominant methanogens in the CC reactor most closely resembled those in the SO reactor, demonstrating that oxygen leakage alters methanogenic as well as general bacterial communities. The online version of this article (doi: 10.1007/s00253-013-5025-4) contains supplementary material, which is available to authorized users. This work was sponsored by a PhD fellowship, a Global Research Partnership-Collaborative Fellows award (GRP-CF-2011-14-S), KAUST Award KUS–I1–003–13 (Bruce E. Logan) and discretionary investigator funds (Pascal E. Saikaly) at King Abdullah University of Science and Technology (KAUST). Special thanks are extended to Hari Ananda Rao for PCR assistance and Mohammed Alarawi and Dr. Shahjahan Ali of the Bioscience Core Laboratory at KAUST for 454 pyrosequencing.